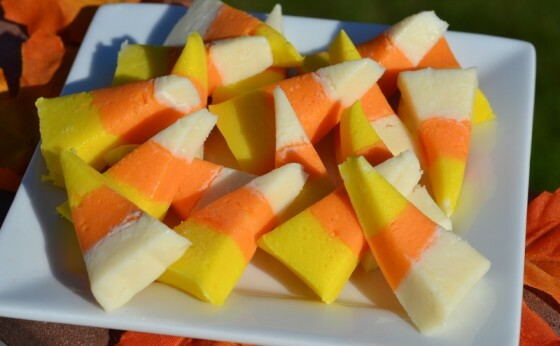 Candy Corn Fudge » Stop Lookin'. Get Cookin'. I love an easy recipe and this is one of them but it does take a little extra time to make because you need to let the layers cool before adding the next one. This is the perfect sized recipe for gift giving so keep it in the back of your mind for the upcoming holiday season. I’m thinking red and green or blue and white fudge would be fun to give and yummy to receive. Go ahead and “Pin” it now to your holiday bulletin board and then in 2 months wonder why you have candy corn pinned to “holiday”. Just sayin’ that’s what I would be doing. Good thing they have a place to add a description or comment to remind yourself of why you have it there. Go ahead, make it now, get the kinks worked out so when you go to make your holiday fudge, it’ll be perfecto! Saw this recipe first at Something Swanky. I saw this recipe first at Something Swanky. I only made half of this recipe and it was plenty to feed at least 2 dozen people. I used a loaf pan and put my wax paper into half of the pan so the layers would be more distinct. Can’t wait to try this at Christmas with red and green! 1. Line a 9×9 baking dish with wax paper. 2. In a large saucepan, combine white chips and sweetened condensed milk over medium-low heat. Stir until completely melted and smooth. Remove from heat. 3. Pour 1/3 of the mixture into prepared baking dish and chill for 15 minutes. (Keep remaining fudge in saucepan, heat off). 4. Stir fudge over low heat until melted and smooth again (should only take a minute or two). 5. Pour 1/3 of mixture into a medium mixing bowl and stir in orange food coloring (or 2 yellow + 1 red). Pour over the white layer in baking dish. Let chill for 15 minutes. 6. Again, reheat the remaining 1/3 of fudge over low heat until melted and smooth. 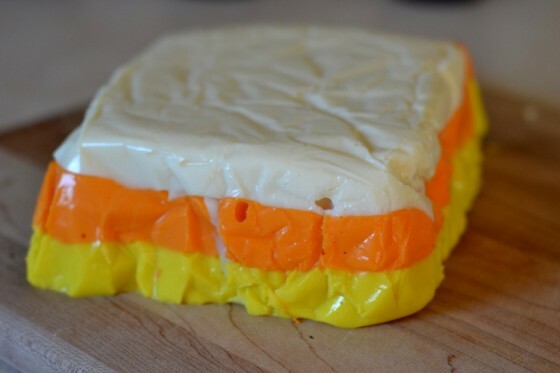 Stir in yellow food coloring and pour over orange layer in baking dish. 7. Let chill for 3-4 hours or overnight (best results). 8. Cut diagonally into small serving sizes. Omg, this looks so yummy! Thanks for stopping buy Diana! How adorable is this fudge? I would have never thought to cut it that way. Great job! This would be great to link to Create It Thursday #23…it’s live now! Hope to see you there! I know – I can’t wait to try it out for Christmas and Easter. Fun color combos. Just stopped over to your Create it Thursday. Thanks for the invite. This tastes like white chocolate fudge. 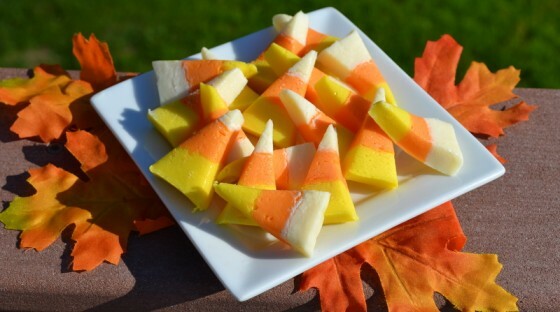 If you could ever find candy corn flavoring you could easily add it to the recipe. 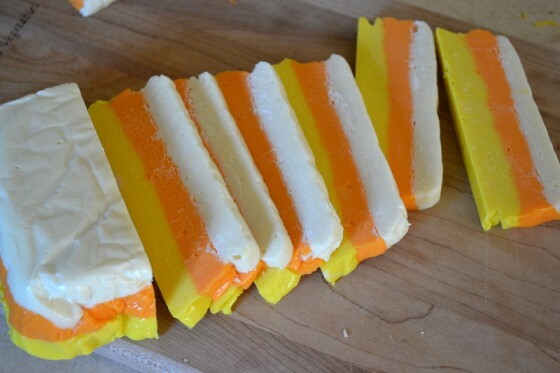 I called it candy corn fudge because of the look not necessarily the taste. 🙂 Thanks for stopping by!